We are grateful to Kevin Hauser of Kuffel Creek Apple Nursery in Southern California for the following text and picture of the famous Delicious apple, one of the most significant American apple varieties. 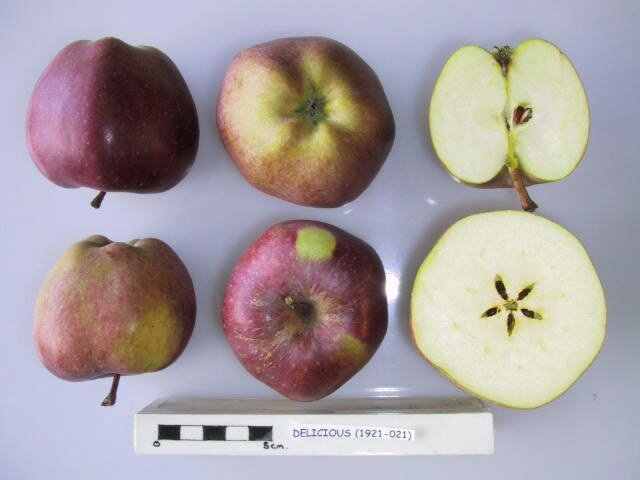 When pioneer apple growers in the San Bernardino Mountains considered diversifying their Rome Beauty orchards to include some more commercially popular varieties, “Delicious” was one of their choices. I should start off by saying that this is not the “Red Delicious” you see in the supermarket, which is big on color but woefully short on flavor. Delicious (also known as Standard Delicious, Old-Fashioned Delicious, Heritage Delicious, or Hawkeye) was a pre-cursor to Red Delicious and is heart-shaped with 5 knobs on the bottom, has a greenish-yellow skin with faint red stripes and a red blush on the sunny side. The flavor is remarkable and folks are astounded when I give them a sample and ask them to try and guess the variety. No one can believe an apple with “Delicious” in the name can be that good, as they’re accustomed to the bland-tasting Red Delicious. Few realize that the story of Delicious is as remarkable as the flavor of this long-forgotten heirloom. The story of Delicious involves two men: Clarence Stark of Stark Bros. Nursery in Louisiana, Missouri, and a Quaker farmer named Jesse Hiatt of Peru, Iowa. According to a 1907 USDA Yearbook, in 1875 a Yellow Bellflower apple tree was destroyed in Hiatt’s orchard, but the seedling rootstock sent up a shoot in the middle of the aisle outside the row of apple trees. This displeased the orderly Hiatt, and furthermore since the rootstock was grown from an apple seed, farmer Hiatt knew that it would most likely produce poor quality apples (more on this another time). Legend has it farmer Hiatt cut the shoot off at the ground twice, and after it kept growing back he finally declared “if thee must grow, thee may”. Hiatt nursed the tree along and it finally produced a single apple in 1881. He was greatly impressed with the apple, as he told his wife it was the best he had ever tasted. Hiatt named the variety “Hawkeye” after the state where he had made his home with his wife and ten children. That winter the seedling tree had a close call; because of winter sunscald the bark was damaged and mostly peeled off on one side. This could have killed the tree, so protection was put on it to shield it from quick temperature changes brought on by daytime sun and nighttime cold. Hiatt set about at once to make more grafts of the tree for his own use and cultivated around the tree. In return the tree showed healthy, vigorous growth and regularly set big crops of the wonderful new apples. For the next eleven years Hiatt tried to interest nurserymen to sell the trees, but people were reportedly turned off by the apple’s strange appearance, which is heart-shaped and knobs on the bottom (the best apples back then were round). He entered it in fairs and contests all over Iowa, but it won no ribbons (it was beat out by Jonathan, Baldwin, Northern Spy, and Wealthy). He carried his apple with him everywhere for others to sample, but all it got him was a snide comment from the Winterset News publisher that Hiatt was batty and his apple no good. Meanwhile in Louisiana, Missouri, C.M. Stark, owner of one of the largest nurseries in the country, was looking for an apple to replace the beautiful but poor-quality Ben Davis. He even had a name picked out for it that he had scribbled on a notepad; “Delicious”. In 1893 to attract applicants Stark Bros. sponsored a fruit show and Hiatt sent a package of apples. When Stark tasted one, he declared “My, that’s delicious!” and instantly recognized the potential. However, Hiatt’s return address had gotten separated from the apples, and no amount of searching by the frustrated Stark could determine where it had come from. By now poor farmer Hiatt would have had every right to be discouraged. Three-fifths of his orchard had been killed by drought and cold waves. He was getting on in years and was now 68 years old, and he had been trying to interest someone in his tree for 13 years, and had no idea that his apple had won the Stark fruit fair; but true to his persistent nature decided to give it another chance. Back at Stark Bros., hoping to find the source of those apples they held another fruit show in 1894 and anticipation was running high; would that barrel of funny-looking apples that delighted everyone show up again? It was with great relief that a barrel of them did indeed show up, with the return address clearly printed on the outside. Stark immediately contacted Hiatt expressing his interest. Hiatt replied with a note offering to give the rights to the apple away if Stark would market it. But C.M. Stark personally traveled to see Mr. Hiatt and paid him well for the rights to propagate and sell his apple, including the right to change the name. Stark Bros. released the apple as the Delicious apple in 1895, and Hiatt died three years later in 1898 at the age of 72. Stark discovered that Delicious was an apple grower’s dream. The tree was healthy and vigorous, and resistant to two of the most serious apple diseases; fireblight and scab. It grew strong branches with wide crotch angles that bore heavy loads and needed little pruning, and the apples hung on the tree until picked instead of just dropping off. It bore good crops each year (instead of every other year like many varieties) and the apples had pretty good color and kept fairly well. The flavor was mild but pleasing and aromatic, appealing to a large range of palates. It could be grown in a wide range of soils and climates, and kept its quality in regions with hot summers (including down here in Riverside, CA). It only took a few years for the variety to spread across the USA. But in 1940 the original Delicious tree fell in the path of the infamous Armistice Day Storm of November 11th. On this deadly day the temperature in the Upper Midwest fell from a balmy mid-60’s down to minus 5 degrees in a matter of a day and a half, with strong winds and two feet of snow. It killed 150 people including many duck hunters who had taken advantage of the balmy weather and were unprepared for the frigid temperatures and froze to death. The severe conditions made locating the dead or injured almost impossible. Since it was still early in the season many apple trees had not “hardened off” for the winter, and thousands of apple trees in the upper Midwest were dead by spring. Among the casualties was the famous 70-year-old parent Delicious tree, the patriarch of millions of Delicious trees that had been grafted from it. It was lamented by growers and nurserymen and newspapers printed obituaries for it. It was an early death for a tree that could have lived much longer. But remember that the original Delicious tree sprouted up from the roots, and behold; only the top of the tree was killed to the ground! The resilient roots once again sent up two shoots about 14 feet apart from each other and formed two new trees, which bore identical Delicious apples. One of these died off but the other continued to bear, and was still exists to this day. But despite the worst nature could throw at this variety, its the market that may be what ends up killing off Delicious. Deeper colored apples are much more marketable. Stark Bros. discovered a “sport” (a branch with different characteristics than the rest of the tree) on a Delicious tree with a deeper red color and named it “Red Delicious”. The flavor on these red sports usually was not as good as the original, but the apples sold better in the store. About this time a group of growers started planting in the central desert valleys of Washington State and found that the warm days with cool nights were perfect for giving the deepest color to Red Delicious. The dry, disease-free climate allowed them to plant huge blocks of Red Delicious and market them at a much cheaper rate, and eastern growers could not match the color or the price and were shut out of the market (much to the delight of the Washington State growers). Over the subsequent years other sports were found that developed the deep color before the apple was completely ripe, allowing it to be picked and shipped green, which improved its durability. Other sports held up well in Controlled Atmosphere (CA) storage, specialized cold storage where the apples are held up to a year in a reduced-oxygen atmosphere. None of these “improvements” did the flavor any good, as the deep red skin has a bitter flavor to it and the flesh is bland and watery. Growers heavily invested in Red Delicious have been watching the price for them drop as competition from China dominates the processed apple market such as juice concentrate. In response many growers are either topworking their Red Delicious orchards (grafting more marketable varieties onto the older trees) or planting new orchards of smaller, more productive trees closer together, quadrupling the yields of the same acreage. Red Delicious is losing market share to better-tasting varieties like Pink Lady, Braeburn, Fuji, and even some of it’s descendants like Jazz and Cameo. But folks can still find Delicious, the apple described by Luther Burbank as “the best in quality of any apple I have so far tested”, locally at orchards in Oak Glen, and it is popular with home gardeners who grow their own apples. Stark Bros. nursery even re-introduced it as “Heritage Delicious” in 1993. It will grow fine just about anywhere in Southern California. Kevin Hauser can be contacted via his website www.kuffelcreek.com. Old-Fashioned Delicious is my favorite apple of all time! Sadly, our local apple orchard took out all their trees about fifteen years ago. Their reason for doing so was that the trees were short lived and not very hardy. Pooh! After reading your excellent article, I now have new ammunition with which to complain! I will also share. ?? ???? The Tasting part says Delicious is resistant to apple scab but the Features part says it has some suspectibility. Is the delicious tree still there? There was a day in the 2014-2015 winter with a low of NEGATIVE ELEVEN! One of the best fresh off the tree eating apples that I have tried. Crisp, flavorful, and juicy.